Many schools still need to move beyond metal detectors, local door alarms, and door intercoms or buzzers to keep schools protected. School safety is a topic that’s of the utmost importance (and rightfully so), especially in today’s world. As there have been far too many tragedies in schools, it’s essential that school safety evolve to meet new and emerging safety demands. Technology can be integrated in many ways to provide schools with the necessary tools required to ensure a safe learning environment for all. The focus here is on safety in the physical space of a school, rather than virtual threats such as cyberbullying, hacking, and data privacy. Many schools still need to move beyond metal detectors, local door alarms, and door intercoms or buzzers to keep schools protected. One concept that would improve safety would be a system to monitor students’ access to various areas of a school building. Such a system would involve a student identification card that a student would swipe upon entering and leaving the school building, classrooms, restrooms, and other areas. This would help with accountability within the school building but could take some time to adapt and could be costly. Data from such a system could be used to identify trends such as time out of class and could verify student attendance. 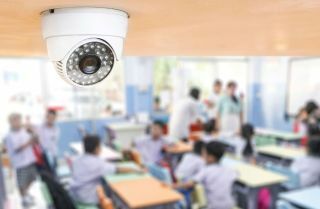 A growing trend in school safety is the use of cameras and video recording devices. These could be deterrents in and of themselves, but they’re also useful for identifying safety issues in the school. While many schools already have this technology, it’s important to make sure that it’s working properly and utilized correctly. Regular testing and inspections should be done on camera systems to make sure blind spots are minimized, the system is functioning, and the recording are backed up and secured. Monitoring the visitors allowed into a school is probably one of the areas of highest concern when it comes to school safety. There are always people that need to be granted access to the school while students are in attendance—whether it’s parents dropping off medications, mail or package deliveries, or repair personnel. This is an area of high vulnerability that’s difficult to address. One solution involves intercom systems with video to identify entrants as well as additional security features. Sometimes visitors are asked to present identification, such as a driver’s license or other official identification, which is then recorded and stored while the entrant is still outside the building. While this is certainly not an infallible system, it can add an extra layer of security. Door security is another area where technology could be used to add security. Lockdown and active shooter drills are necessary, and there are many ideas that can be used to help secure a classroom in such instances. One of the simplest solutions I’ve heard about involves using an old six-inch piece of fire hose to secure the overhead hinge mechanism on a classroom door so that the door cannot be forced open easily. This is an example of an extremely simple piece of technology that could be obtained for free and could provide an excellent layer of protection. Other similar devices, such as interior door latches that drop into the floor to prevent the door from being opened, serve a similar purpose but are costlier. Magnetic release and automatically closing/locking doors are other possible solutions to ensure that every door is closed and locked. This system also has its issues. It’s important to note that the type of security device that would be needed would vary greatly from building to building, as the design of some classrooms will mean that such devices cannot secure the door. Exterior door security is yet another area of concern. While the entrance to the main office of the school can generally be more closely monitored, side doors and emergency exits provide another challenge. The main concern with these doors is that a student could open them to get out of the building or allow someone in. Due to fire code regulations, these doors cannot be locked from the inside. Local sounding alarms on these doors can tell building staff when the door is opened, but they do little to prevent someone from entering an opened door. Other options might include exit doors with a time-delayed opening. A person exiting the building when the doors are not open would have to hold down the panic bar for a set period of time. With properly integrated technology, the exit delay would give time for a local sounding alarm to go off, for the main office to be notified, and even for contacting the police department. While this would be a step in the right direction, it would have to be approved and reviewed to assure compliance with building and fire safety codes. Technological advances in school safety will continue to be front of mind in the foreseeable future. Ensuring a safe school environment for all should be a top priority for all schools. While there are ways to integrate technology to improve safety, unfortunately there are limitations and no one perfect solution exists. This opens the door and provides a challenge to innovators to step up to try to develop new and better solutions to help make schools more secure. Steven Lahullier is an elementary school technology teacher at the Robert Gordon School in Roselle Park (NJ) and a doctoral candidate in the Educational Technology Leadership program at New Jersey City University.